Practically no trace now remains of Belvidere Hospital, a large housing estate having been built on the site. The Belvidere once played a key role in protecting the population of Glasgow from the ravages of infectious diseases, including smallpox. The hospital was built on the most up-to-date plan, and took shape over a prolonged period of construction beginning with temporary wooden huts that were later replaced by brick buildings. Epidemics of infectious diseases were amongst the major threats to life to the urban poor, living in the overcrowded districts of the rapidly expanding and industrialising city. Although the parochial authorities made some provision for paupers, this was very limited and strictly speaking only paupers were eligible for admission. From 1862 local responsibility for public health in Glasgow rested with the Board of Police, and it was under their auspices that a temporary fever hospital was built in Parliamentary Road in 1865. Proximity to the centre of population and a restricted site rendered the hospital inadequate in the face of a severe epidemic of relapsing fever in 1870. 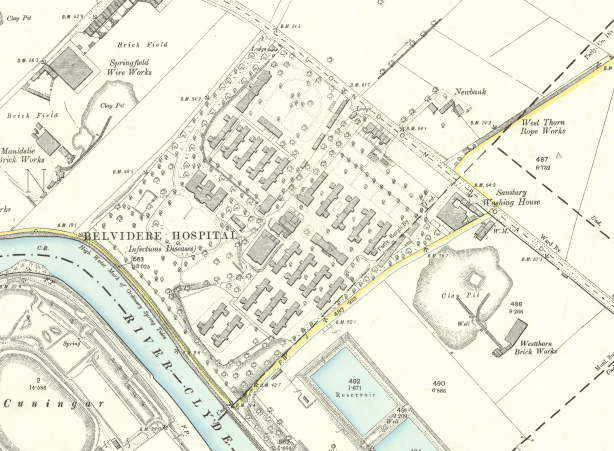 As a result, Belvidere House and its 33 acre estate were purchased to provide a site for a permanent fever hospital. John Carrick, the Glasgow City Architect, was responsible for drawing up plans for the new hospital. The first ‘ temporary shed’ was occupied on 19 December 1870. Eight timber pavilions were planned, four had been finished and partially occupied by Christmas, and two were expected to be completed before New Year. In 1871 it was decided to build a separate smallpox hospital at Belvidere. Great lengths were taken to ensure that the most up-to-date features were incorporated in the design and many other hospitals were visited to this end, including the Herbert Hospital in London ‘reputed to be the finest specimen of a pavilion hospital in existence’. The local press had called for the design of the new hospital to reflect ‘the experience and results of modern science’, hoping that the authorities would not adopt the ‘old style of building tall structures’ but rather would follow the model of the recent temporary blocks at Parliamentary Road built on the pavilion principle ‘so strongly advocated by Miss Nightingale, and by writers on the subject of hospital accommodation’. The ‘temporary’ hospital blocks at Parliamentary Road were anticipated to last for around twenty years. There were those in the medical profession who considered that after occupation for that period of time all hospitals should be remodelled, if not entirely razed and rebuilt. Nothing seems to have been done immediately but in 1874 plans were drawn up for the new permanent structures. Five single-storey, brick ward pavilions were built, though still described as ‘partially erected ‘ in December 1875, as well as the necessary ancillary buildings. These works were completed in 1877. The pavilions were aligned roughly north-south, and each was divided into four wards, two for acute cases in the centre, two for convalescents at the ends. The flooring was of close-jointed oak, the inner walls coated with Keen’s cement and the wards warmed by hot-water pipes and open fires. Roof-ridge ventilators (Boyle’s) were a distinctive feature on the outside of the buildings. To the south-east was a large wash-house. Matrons’ and medical superintendent’s houses and dormitories for the nurses occupied a position at the north-east corner of the grounds, close to which was the morgue. The original kitchen block stood opposite the north end of the central pavilion, it was surmounted by a small spire, which also served as a bell tower and clock. It was designed to minimise contact between the kitchen staff and the nurses: a platform under a verandah on the southern side of the kitchen allowed the nurses to receive the food which was served through a window. The grounds were laid out into plots of shrubs and flowers by Mr M’Lellan, the Superintendent of Glasgow city parks. The team working alongside the architect were James Hannah, clerk of works; John Porter, builder; William Lightbody, joiner; Robert Nelson, plasterer; Wallace & Allan, plumbers and gas-fitters; John M’Ouatt & Sons, slaters; and James Comb & Son, heating engineers. In 1879 work began on permanent buildings to replace the temporary sheds of the fever hospital on the south-east side of the site. Four brick pavilions were built to begin with. In 1882 the Medical Officer for Health in Glasgow, J. B. Russell, produced a ‘Memorandum on the Hospital Accommodation for Infectious Diseases in Glasgow’, which resulted in the further expansion of the site. Russell’s memorandum itemised the requirements for a large infectious diseases hospital and considered various details of its construction. Over the course of the next five years pavilion after pavilion was added until there were thirteen altogether, providing 26 wards and a capacity for 390 patients. In addition there were ancillary buildings, providing kitchens and laundries etc, so that the hospital was as self-sufficient as possible, thus limiting the number of visitors to the site. The extended hospital was officially opened on 4 March 1887. The simple polychrome of thin, horizontal bands of white amongst the red bricks created a streaky bacon effect. This unusual construction for hospital buildings in Scotland gave them a utilitarian air reminiscent of Glasgow’s industrial buildings. Aerial photograph taken in 1952, from Britain from Above. The river Clyde is in the foreground, the smallpox hospital to the left and fever hospital to the right. In contrast to the polychrome-brick of most of the buildings, stone was used for the large administration block, which also contained the nurses home, recreation hall and senior staff residences. It was a large, somewhat austere building erected on the site of the original Belvidere house. The central range was designed as an echo of the house it replaced. In 1929 a house was provided for the Medical Superintendent and a new observation ward was opened in 1930. After the inception of the National Health Service in 1948 various additions were made and changes in function introduced. Two important developments at Belvidere were the opening of the first Cobalt Therapy Unit in Scotland in February 1961 and in March 1973, the opening of the second Neutron Therapy Unit in Britain. The hospital closed in 1999. After years of neglect the derelict buildings were mostly demolished in 2006 – all except the administration block and nurses’ home. Hypostyle Architects acting for Kier Homes Ltd designed the masterplan for the site development. Divided into three zones: high density urban blocks, urban terraced housing, and low density sub-urban housing. The high density section nearest the London Road comprises four-storey blocks of flats and three-storey town houses. The terraced housing, of two stories, creates a buffer zone between the flats and the low-density housing on the south side of the site. Original plans to convert the listed admin block were subsequently scrapped and permission granted to demolish the remaining shell of the central block for more low-density housing. The original master plan was for 351 residential units: 145 flats, 115 townhouses and 91 houses. This entry was posted in infectious diseases hospital, Scottish Hospitals and tagged architect, Belvidere Hospital, Florence Nightingale, Glasgow, hospital re-use, Hypostyle Architects, infectious diseases hospital, John Carrick, Kier Homes, pavilion plan, Scottish Architecture. Bookmark the permalink. I was admitted to Bevedere as I had Scarlet Fever in 1959. I was well treated but found as a child being in isolation , it was also over Xmas. I think it set me on my career as an RN. I was a Nurse for 36 years. It seems awful these days for children to have been kept away from their families when they were poorly and in hospital. Even in the 60s visiting times were short and strictly kept, as I remember from when I had my tonsels out aged 6. My father was Dr Peter McKenzie, superintendent from about 1947 until he retired in 1979. He setup the first respiratory intensive care unit, the first n Scotland and among if not first in the UK. This deal with patients paralysed mainly with polio, with ‘iron lungs’ and later positive pressure ventilation via tracheostomy. The latter was very innovative and reduced mortality dramatically compared to the iron lung. Cross infection was reduced by installing many sinks with soap and water. My father was the medical superintendent, Dr Peter McKenzie, who set up the respiratory intensive care unit, to treat paralysed patients, mainly from polio, the first such unit in Scotland and possibly in the UK. He published a book of his memoirs and retired in 1979. Do let me know if you wish more info. Thanks for this report and the history of Belvidere. I remember the hospital well – I was on the medical staff in the late 1960’s. There was great atmosphere, almost like a family, especially in the doctors’ dining room and sitting room. But, of course, with the advances in medical knowledge and science, the need to keep patients separated from the visitors diminished and the modernisation of the hospital was already reaching it’s limits when I was there so the final closure was inevitable. Did you know my father, Dr Peter McKenzie, superintendent from about 1947 until he retired in 1979? I hope this reply reaches you. Yes I knew your father very well – he was the head of the infectious diseases part of the hospital all the time that I was there. He was a doctor in the traditional sense – not a heartless scientist seeing patients more as broken machines, he saw patients as people and was willing to spend time talking with them, especially if they came from the Vale of Leven area…! He never spoke much about his family so I wasn’t aware of his children or even if he had any. I knew he later became interested in interviewing people with interesting stories to tell and recording what they told him – I don’t know the correct name for that sort of historical research but I think his work has survived – maybe you have it. I was born in Belvidere hospital in 1972! My mum has passed and my dad has drink related Alzheimers. Did anyone work there in 1972 and be able to tell me if me being born there would have been normal practice as it was an infection hospital at the time???? Hello Shay – I worked in Belvedere until the end of 1969 (in the original infectious diseases part) and its probably traditionally remembered as an ID hospital but there was also a department for fitting artificial limbs, a radiotherapy department (a very advanced one) and a maternity unit. They were all located apart from the ID hospital and the staff didn’t really have much contact with us. So being born there in 1972 would probably have been normal for families living in that part of Glasgow. My father was a doctor at Belvedere Hospital. He was specialising in Infectious diseases. He worked there from late 60s to 1975. His name was Dr. Hashmat Jamil Siddiqui.